Many of the statues and memorials in D.C. seem as though they are permanent. But this is often not the case, with many of them being moved around, placed in storage, or changed as necessary to accommodate new construction or development. 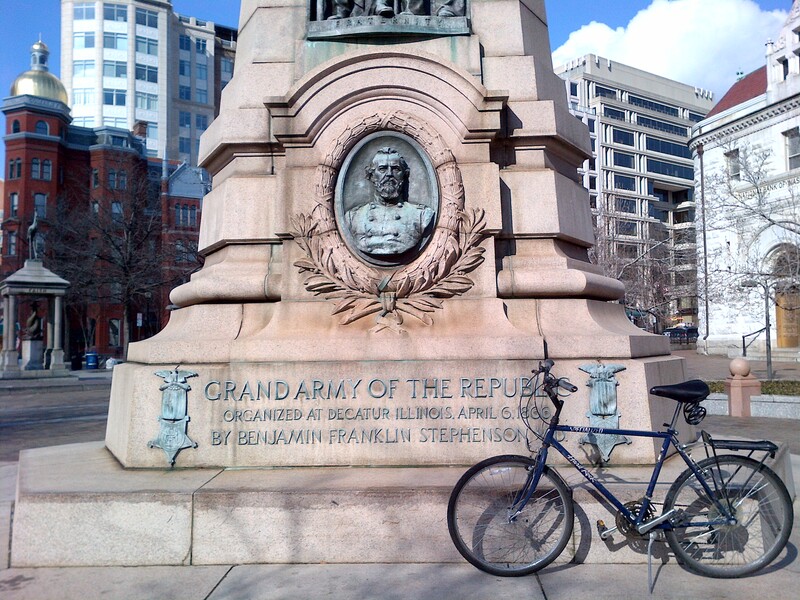 This is the case for The Grand Army of the Republic Memorial, which was the destination of this lunchtime bike ride. The Grand Army of the Republic Memorial is presently located across the street from The National Archives and Records Administration Building and adjacent to the U.S. Navy Memorial in Indiana Plaza, at the intersection of Pennsylvania Avenue and 7th Street (MAP) in northwest D.C.’s Penn Quarter neighborhood. The memorial was moved in 1987 from it’s original location, which was just a few yards away where The Temperance Fountain is now located. The fountain was moved from its original location a few blocks away during the renewal of Pennsylvania Avenue by the Pennsylvania Avenue Development Corporation. Shortly after the conclusion of the American Civil War, groups of men began joining together in fraternal organizations. These organizations were first formed for camaraderie, but eventually evolved into groups which possessed and wielded significant political influence. Emerging most powerful among the various organizations would be The Grand Army of the Republic. Founded in Decatur, Illinois on April 6, 1866 by Dr. Benjamin F. Stephenson, membership in the Grand Army of the Republic was limited to honorably discharged veterans of the Union Army, Navy, Marine Corps or the Revenue Cutter Service, who had served between April 12, 1861 and April 9, 1865. The organization became among the first organized advocacy groups in American politics, lobbying the U.S. Congress to establish veterans’ pensions, advocating for voting rights for black veterans, and supporting Republican political candidates. As one of the more powerful political organizations in the late 19th century, it also helped to establish The Old Soldiers’ Home, which would later become The Department of Veterans Affairs. Also, under the leadership of John Alexander Logan, the organization was largely responsible for establishing the Memorial Day holiday at the end of May, as part of their Decoration Day campaign. At it’s height in 1890, it would number almost 500,000 veterans of the “War of the Rebellion,” with chapters or “posts” in every state except Hawaii, even those of the former Confederacy. But the organization continued to allow only Union veterans of the Civil War, and through attrition it grew smaller each year. It was finally dissolved in 1956 when its last surviving member, Albert Henry Woolson, passed away. Memorials to the Grand Army of the Republic include a commemorative postage stamp, a U.S. Federal highway, and various statues and physical memorials in hundreds of communities throughout the country. 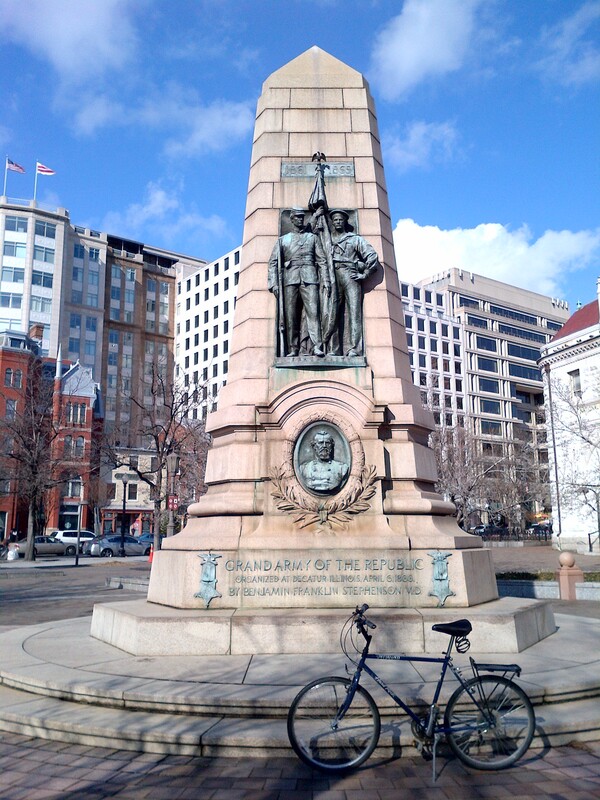 The D.C. memorial was erected by the Grand Army of the Republic Memorial Foundation using funds that the U.S. Congress appropriated in 1907, and was dedicated in 1909. The memorial’s pink granite centerpiece was designed by the firm of Rankin, Kellogg and Crane, and P.R. Pullman and Company, was responsible for the foundation of the monument, which had to be specially made due to the significant weight of the granite column. Scottish-American sculptor J. Massey Rhind sculpted the bronze statue and inlays for the memorial. 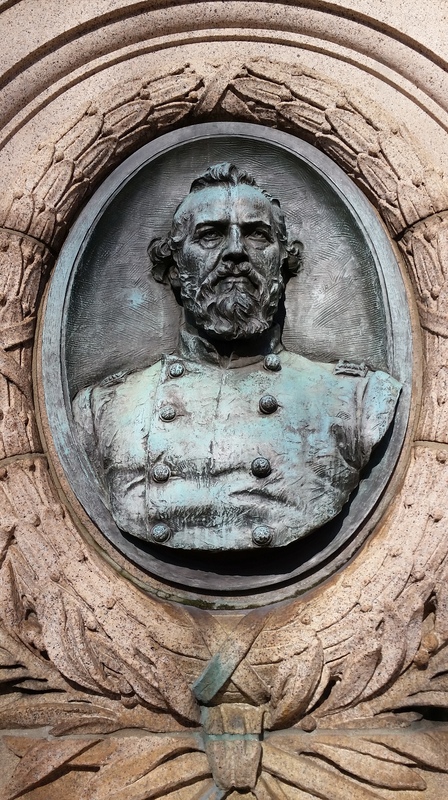 Also known as The Dr. Benjamin F. Stephenson Memorial, it is part of a group of statues entitled “The Civil War Monuments in Washington, D.C.” which are spread out through much of the central and northwest areas of the city, and are listed as a group on the National Register of Historic Places. With the dissolution of the organization, the memorial is now owned and maintained by the National Park Service. 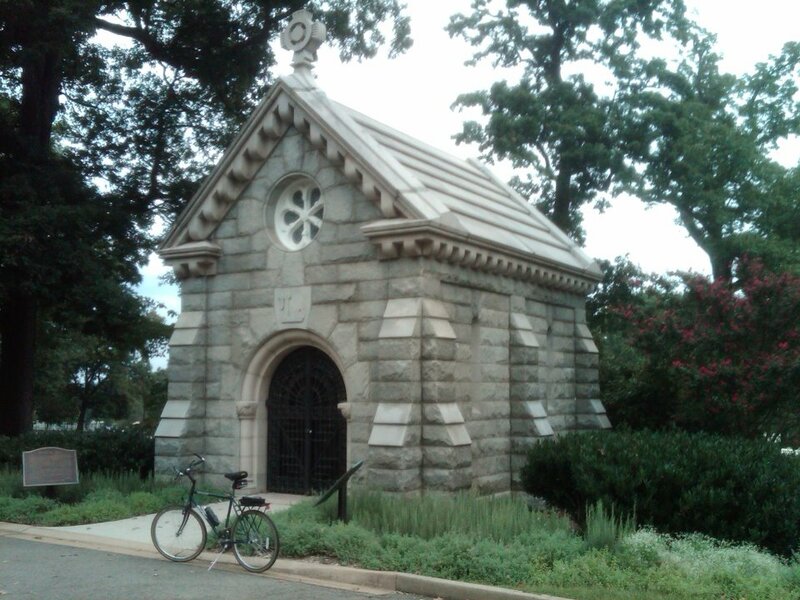 On this Memorial Day, I am writing about my bike ride to the final resting place of the founder of the Memorial Day holiday. Located within the United States Soldiers’ and Airmen’s Home National Cemetery, the forerunner of Arlington National Cemetery and is located on Rock Creek Church Road in northwest D.C. (MAP), is the tomb of John Alexander Logan. 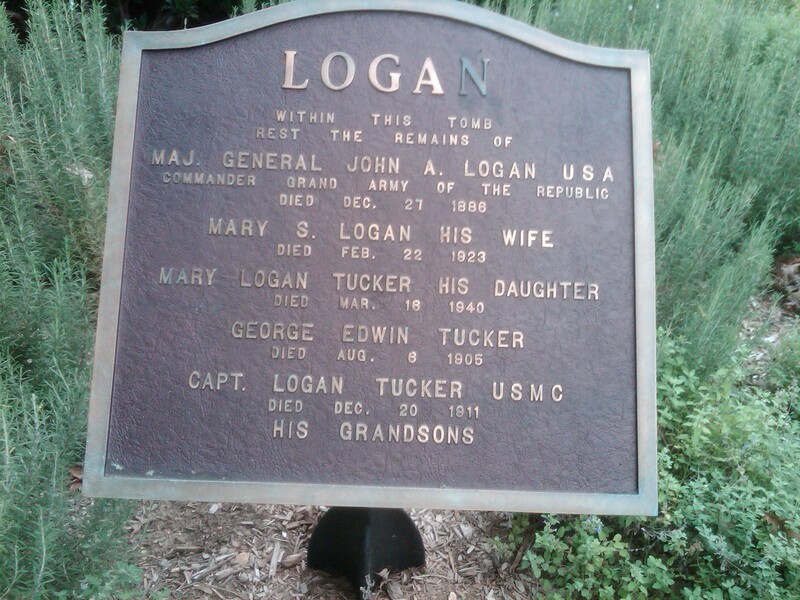 An American soldier and political leader, Logan served in the Mexican-American War and was a General in the Union Army during the Civil War. He later entered politics and was elected and served as a State Senator in Illinois, and subsequently a U.S. Congressman and Senator. He also ran but was an unsuccessful candidate for Vice President on the ticket with James G. Blaine in the election of 1884. More than any of his other achievements, he is probably best known as the founder of Memorial Day. As the Commander-in-Chief of The Grand Army of the Republic from 1868 to 1871, he is regarded as the most important figure in the movement to create and recognize Memorial Day as an officially recognized national public holiday. Memorial Day is a Federal holiday wherein the men and women who died while serving in the United States Armed Forces are remembered. Celebrated annually on the final Monday of May, the holiday originated after the Civil War to commemorate the Union and Confederate soldiers who died in the Civil War, and was called Decoration Day. Over time, the holiday has been extended to honor all Americans who have died while in the military service and was renamed Memorial Day. It also typically marks the start of the summer vacation season, while Labor Day marks its end. So today as you pause to honor those service members who paid the ultimate price while serving their country, you might also want to remember John Alexander Logan. He may not be the reason for the holiday, but there might not be a holiday without him.